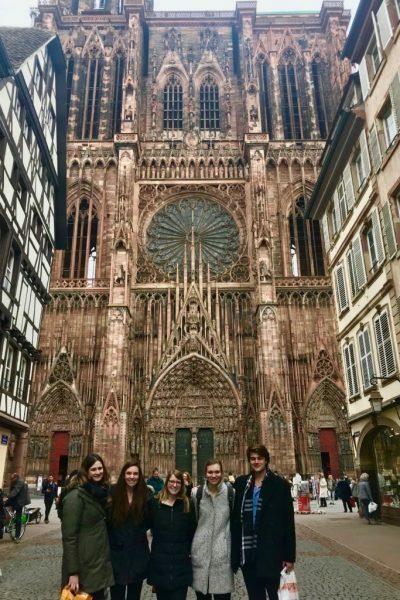 A group of W&L Law students was in Germany over spring break for an intensive week-long exploration of German law and legal culture. The Transatlantic Seminar, organized by Prof. Russ Miller, brings together American and German law students for a scholarly exchange on both countries’ legal systems, with an emphasis on Constitutional Law. We were standing in the reception area of the Genussakademie. Professor Miller had just finished his speech welcoming us to the Transatlantic Seminar. It had been one filled with promises of intellectual engagement, hard work, but above all, comradery and friendship. Maybe it was naivety or cynicism, but the polite smiles and side-glances that filled the room suggested that we didn’t fully appreciate the truth of Professor Miller’s words. How wrong we were. Within minutes of stepping into Chef Lucian’s dojo, a remarkable transformation had begun to take place. Soon, the polite smiles changed to laughter and fist bumps. We were no longer strangers gathered in some building. We were friends cooking a dinner for each other in a warm kitchen. It is only fitting that this happened on our first night together. After a wonderful meal consisting of several courses, the evening turned to the first session of the seminar. The discussion covered comparative law theory. The work of Günter Frankenberg asked us to approach the comparative project by distancing and differencing ourselves from the subjects of our comparison. By distancing, we abandon our preconceived biases and thus resist the power of prejudice and ignorance. In differencing, we allow the foreign legal system to speak for itself, deepening our understanding of it through its own value system. In its own way, Frankenberg’s framework would guide our growth during the week to come. Reveling in each other’s differences would spark class discussions that truly challenged the ways each of us thought. This in turn lead to greater closeness and franker, more sincere conversations among each other. The last night of the trip would go on to prove Professor Miller’s prediction correct. The trip would end as it only could have—with two now dear friends talking late into the night. The seminar on Monday marked the first full day of work. We walked with our German colleagues in the morning to the Jones Day office in Frankfurt. Once there, we were greeted with fantastic hospitality and a tremendous facility in which to conduct our seminar. The seminar began in the morning with an examination of traditional comparative law theory and methodological approaches. The dialogue between the American and German students warmed up throughout the morning and lead to a stimulating exchange of ideas and perspectives. The afternoon, provided more thought provoking discussion of comparative international law and the methodologies for its effective analysis. In the evening the group visited Pizzeria Da Cimino, Professor Miller’s favorite pizza place from when he lived in Germany. It blew away our expectations. I would travel back to Frankfurt just for that pizza alone. Day two of the Transatlantic Seminar was when things really started to ramp up. Let me first start by describing how I usually started my day. I generally tried to be up by 7:30 am—that didn’t always work out—so that I would have enough time to shower and enjoy the best continental breakfast I’ve ever had. My biggest regret from the trip is that I didn’t eat enough from that breakfast. So, once I had sufficiently filled up on eggs, bacon, croissants, and lox we all left for the Jones Day office. We all got to the office by about 9:30 am, and let me just say that one of the highlights of my trip was getting to spend some time in Jones Day’s beautiful office. 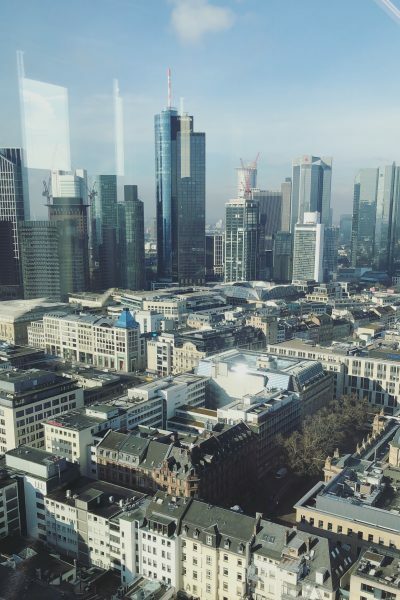 We were on the 25th floor and had an amazing view of the Frankfurt skyline. The view was great, but the conference room we were in was even better. Jones Day was great to us and put out a ton of different drinks like coffee, water, apple juice, and soda. The coffee was definitely a life saver. Once we were all settled into the conference room we began our discussion for the day. Today’s topic was German constitutional law—we would get to U.S. constitutional law the next day. Professor Miller—along with the German students—were super helpful in teaching us German constitutional analysis in just three hours. We worked until about 12:30 and then had two hours for lunch. On this day all of us went to this café that Quentin, Caroline, and I had gone to the day before. This place was amazing! The day before I had this cheese stuffed gnocchi and today I had the ravioli. This café was definitely one of my favorite places to eat. The last three hours of our seminar day were dedicated to preparing for our group presentations. The American students were assigned to present on the German Network Enforcement Act. For our presentation, we went through the traditional German constitutional analysis to decide whether the act was constitutional. After we all got back to the hotel from the Jones Day office, we had about an hour before dinner. Tonight we were going to a traditional German restaurant. For this meal, I order this ham and cheese stuffed schnitzel and had some apfelwein—apple wine. The schnitzel was amazing! By now you’re probably realizing that I really enjoyed the meals I had while in Germany. Let’s just say I came back to the U.S. a little heavier. I don’t think I have ever slept so little in week, but I also don’t think I’ve ever had so much fun. All in all I had an amazing time in Germany and want to thank Professor Miller for setting up and running the seminar, and also Jones Day for hosting us. If you have a chance to participate in the Transatlantic Seminar I highly recommend it! Wednesday’s session was engaging to say the least. The readings for that day’s morning session centered around the U.S. Constitutional protection of free speech. Our German colleagues grappled with the disparity between Germany’s protection of human dignity over some speech and the seemingly “anything goes” version American free speech as protected by the First Amendment. In the afternoon session, both sides put their new knowledge of comparative constitutional law to good use during two presentations. First, the German students analyzed the recent events of Charlottesville, Virginia through the lens of the First Amendment. Second, the Americans discussed Germany’s new Network Enforcement Act while comparing and contrasting it to the U.S. Community Decency Act. Both groups did an excellent job of applying the concepts of the week to these interesting situations. In the evening, Jones Day hosted a lovely reception for the students, offering delectable hors d’oeuvres, refreshing beverages, and witty discussion. It was a well-earned break during a busy yet rewarding week. On Thursday during our trip, we departed from Frankfurt and travelled to Karlsruhe, Germany to visit the Bundesverfassungsgericht—Germany’s Federal Constitutional Court. Visiting this court was a unique opportunity for both the American and German students. Many of the German students had never visited their own Federal Constitutional Court despite having visited the American Supreme Court. For the American students, it gave us the opportunity to compare and contrast how our courts represent themselves to our societies. For me, the difference in the physical appearance of the Federal Constitutional Court struck me. When we turned the corner, the building did not look how I anticipated at all after my experience in the American legal system. The building was modernized, edgy, and full of windows. Professor Miller explained that the idea behind the building was to demonstrate the transparency of the Federal Constitutional Court. The building is full of windows and glass so that the people of Karlsruhe are overseeing the work done at the court to ensure transparency in the decisions. This concept was so foreign to me, but I found it incredibly intriguing. I thought it was fantastic that the Court and its architect wanted to represent itself in this way. Meanwhile, the architecture of the American Supreme Court exudes authority, grandeur, and dignity. At times, the Supreme Court can seem imposing, but it clearly sends the signal that it boasts the supreme law of the land. My first look at the Federal Constitutional Court did not elicit such a response, but I grew to love it when understanding its history and purpose. Justice Paulus is a justice of the First Senate of the Federal Constitutional Court. His clerk directed a tour of the Court for the students attending the seminar. We learned how the Court works, the story behind the justices’s robes, and walked throughout the building. We visited the Court’s museum, learning about the original justices, what kind of cases the justices have dealt with, and saw portraits of all the justices who have served on the court. Afterwards, we had the opportunity to speak with Justice Paulus himself and ask him questions on when justices dissent, what his favorite case was, how the justices interact, and what he will do after leaving the court. Both American and German students asked questions since this was a unique experience to pick the brain of a justice. I enjoyed listening to the thoughtful questions posed by my colleagues and listening to Justice Paulus’s genuine responses. Visiting the Bundesverfassungsgericht differed from my experience in the American legal regime and challenged me to continue learning from our differences rather than concentrating on them. I felt closer to my colleagues after visiting this important court in the German legal regime. I felt I better understood how my German colleagues approached problems and enjoyed watching my American friends soak up a completely different court experience than we are accustomed to. I am fortunate to have met these people, traveled with the journal student editors, and have had the opportunity to visit the Federal Constitutional Court in Karlsruhe. After visiting the Bundesverfassungsgericht, the group traveled by train to Strasbourg, France. The trip was quick and there was never indication we had left Germany and entered France. That night we went out as group and entered a meal at L’Ancienne Douane for traditional Alsatian food. A couple of my classmates were brave enough to order the snails, but I decided to just watch and take photos. After that dinner we enjoyed a walk through downtown Strasbourgand along the river to get back to our hotel. The next morning we woke up bright and early for the half hour walk to the European Court of Human Rights. The walk over was through—what we determined to be—Strasbourg’s Embassy Row, what we later learned is the street named Aevenue de l’Europe. We first came upon the Conseil de l’Europe before looking across the river at the European Court of Human Rights. The building is shaped like the scale of justice—with two round sides connected in the middle. We took a few pictures, before being handed out visitor badges and led through a quick security check. As someone interested in human rights and with hopes to work in criminal law, entering the halls of The European Court of Human Rights was one of the highlights of my week. Our tour of the building included the grand chamber—where all the cases are brought and heard. We also walked across the hall to the chamber of the Commission of Human Rights, which became obsolete in 1998. In that room we were welcomed by two speakers, the first, a researcher for the court from England and the second, a polish attorney who works at the court for his country. These two individuals gave us inside information about their roles within the court, how the court is structured and works, interesting cases that were decided, and answered all of our many questions. Some of the coolest parts of this talk besides learning about the European Court of Human Rights—getting to sit in the actual seats the commission sat in and clicking the buttons to use our microphones to ask questions. Friday afternoon after our visit to the European Court of Human Rights, the group had a few free hours to explore the greater city of Strasbourg. For some, this meant an extended lunch and catnap in the café patio sun before taking in views of the Strasbourg Cathedral. For others of us, this meant a quick lunch of the regional specialty, flammkuchen,—think very thin, crispy flatbread—before embarking on as much sightseeing and souvenir shopping as our time allowed. We first visited the Cathédrale Notre-Dame de Strasbourg, which was equally stunning in the daylight as when we’d seen it lit up the night before. The cathedral has a characteristic pink hue due to the sandstone used for its construction from the Vosges Mountains in eastern France, near the border of Germany. Significant parts of the cathedral are considered Romanesque architecture, even though it is primarily considered one of the finest examples of late Gothic architecture. From the cathedral, we next went in search of macaroons and a local chocolate shop, with the direction of our German colleague. We then explored Place Kléber, the largest square in the city center—part of a UNESCO World Heritage Site, and home to many historical points and shops. Unfortunately we were unable to make it to the charming La Petite France neighborhood due to limited time constraints. My favorite part of this experience overall was the ability to engage with our German colleagues over the course of our visit and compare and contrast their takeaways with our own. Maybe it was the Kinder Eggs. Maybe it was the schnitzel. But seeing the Transatlantic Seminar come to a close on Saturday morning felt utterly surreal. I felt that I had arrived in Germany, I blinked, and it was all over. While the days spent in the Jones Day office overlooking the Frankfurt skyline were behind us and the end of free continental breakfasts fast approaching, the moments and the friendships of the week were there to stay. During our intensive meetings in the mornings and afternoons delving into comparative law, new words and phrases were added to our vernacular. “Distancing” and “differencing” became the words of the moment as potential keys to success for the comparative lawyer. And while we attempted to master these terms and theories, distance and difference could not describe the remarkable social experience we each felt with the program and our German law student colleagues. Did we learn to distance ourselves from our own legal regimes? Perhaps, maybe. But there was no distance between the American and German law students. In a short week, new friendships were forged over apple wine, missed trains, and delayed luggage. And differencing? To be sure their were moments of pure appreciation and admiration between cultural differences, from the way we approached a legal problem to the nuances of tackling a group project. But above all, I could not help but to see the overarching similarities between us all: Young and aspiring legal minds, passionate about comparative law, brought together from all walks of life to learn from Professor Miller and from each other. So as I sat in the Frankfurt Opera House watching La Cenerentola, drifting in and out of moments of quiet reflection punctuated by brief pangs of dread about how I was going to fit the 30lbs of chocolate I bought earlier into my suitcase, I could not help but think, is this as good as it gets? No, it could not be. Though the week was short, the memories and the moments were many, and I knew that each one had become a part of the tapestry that makes each of us, another thread added to each of our stories. The Transatlantic Seminar was more than a seminar, a class, or a moment of pure cultural exchange. It was a seminar that touched–and changed–every one of us, for the better.